Everyone knows that 2015 was a challenging year in the oilpatch. 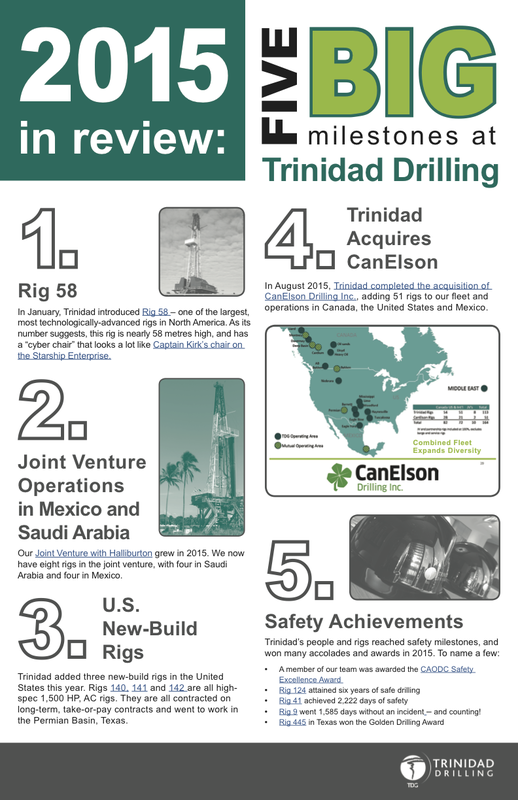 Yet at Trinidad Drilling, we took on those challenges and continued moving forward with exciting new rig technology, our joint ventures in new locations, and an important acquisition that made us bigger and stronger. Most importantly, Trinidad also maintained its super-impressive safety record. No matter what, safety is always number one at Trinidad. Take a peek at five of our most impressive milestones in 2015, and celebrate with us (click to enlarge infographic). May 2016 be a prosperous, happy and safe year for all of you! ← How well do you know the rigs? Our holiday crossword will put you to the test!